Jonathan McCartney joined the firm in 2008, and practices in the areas of public utility and regulatory law, railroad defense litigation, employment law and insurance defense. 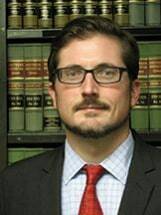 He has represented clients in Courts throughout Louisiana, and practices extensively before the Louisiana Public Service Commission and Louisiana Office of Conservation. Jonathan is a board member of the Louisiana Association of Defense Counsel as well as a member of the board of the Public Utilities Section of the Louisiana State Bar Association. Prior to joining the firm, he served as a law clerk to Judge Scott Crichton who is now a Judge on the Louisiana Supreme Court and Judge Jeanette Garrett who is now a Judge on the Louisiana Second Circuit Court of Appeals. Jonathan received his law degree from Louisiana State University, where he was an officer on the Moot Court Board, a member of the nationally ranked Tax law and Environmental law moot court teams and winner of the Ira S. Flory Trial Competition. He received his undergraduate degree from the University of Texas with honors, where he was president of the nationally ranked debate team. He also volunteers as assistant coach to several local High School debate teams.